Just a quiet humming despite the super cutting performance: 50 mm in wood, plastic 30 mm, non-ferrous metal 10 mm. No problem to cut Plexiglas, glass fibre reinforced plastic, foam, rubber, leather or cork. Base housing of cast steel with rubber feet. For stability and working without vibrations (also suitable for bolting down). Side suction channel with connection and adapter for dust-free working. Includes 5 each coarse and fine saw blades. The DSH is equipped with a suction channel and connection. For dust-free and clean working. We recommend the use of our vacuum cleaner controller AS/E or our compact workshop vacuum cleaner CW-matic. 1. Holder for saw blades with pin ends. 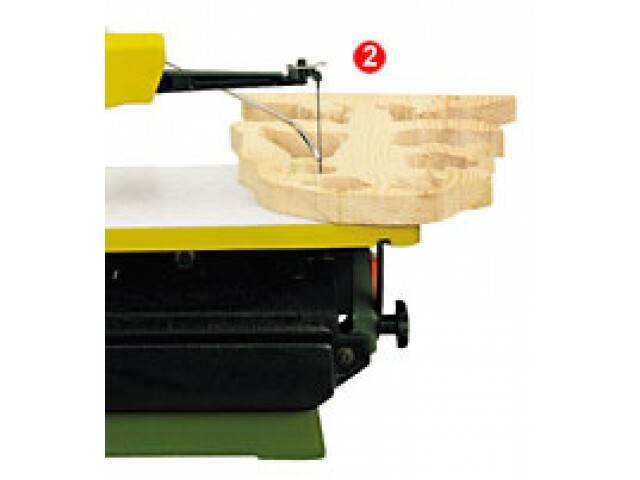 Also for clamping normal fretsaw blades (without pin ends). 2. Slender overarm for unobstructed view from top. 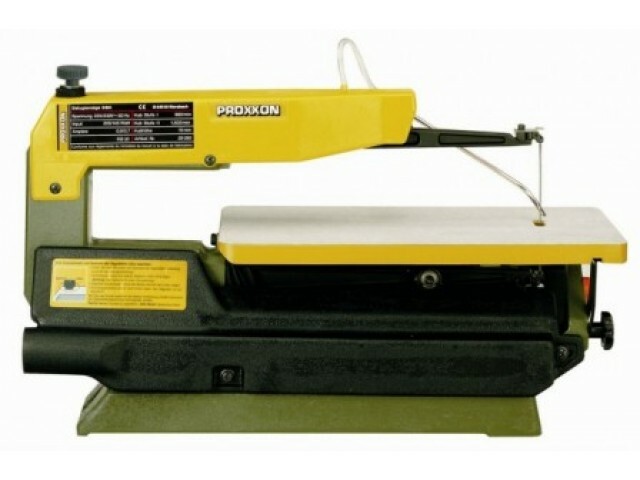 The ideal machine, especially for frequently occurring internal cuts. 3. Air blower with adjustable air nozzle provides clear visibility. Stable table of die-cast aluminium (360 x 180 mm), can be tilted by 45° for mitre sawing. 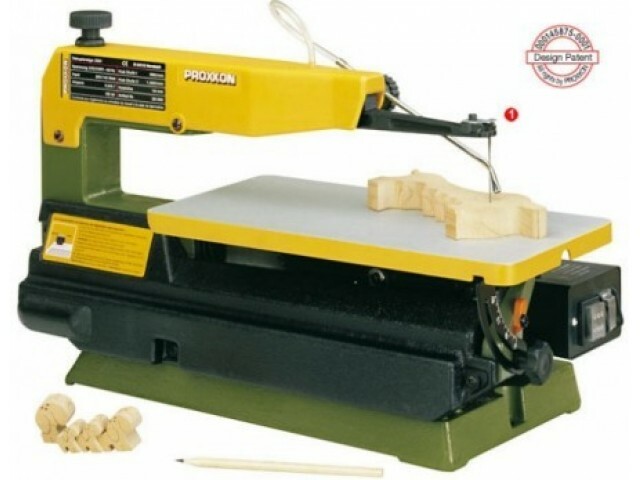 Ideal for cutting soft and hard wood, plastics as well as soft and above all also thicker material. 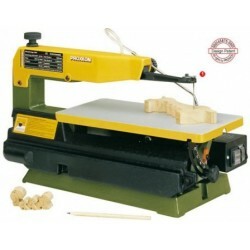 Ideal for cutting thin materials, soft and hard wood as well as plastics. Ideal for cutting non-ferrous metals, PC cards, plastics, perspex and wood. 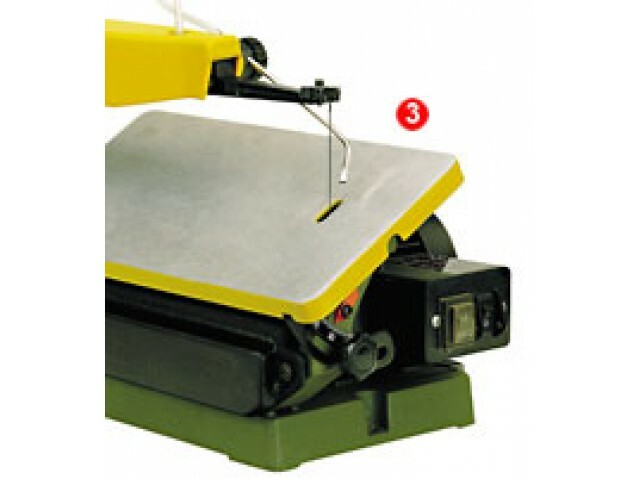 For cutting soft and hard woods, plastics, Perspex, soft non-ferrous metals. For hard metals like iron or PERTINAX. These blades cut all directions and obviate the turning of the workpiece (advantageous, especially with bigger workpieces). A 1.5mm hole is required. Ideal for plastic, hard and soft woods. 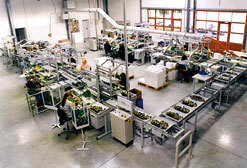 We have been producing PROXXON MICROMOT tools for almost 30 years. High quality fine power tools for model makers, instrument mechanics, form makers, tool makers, opticians, jewellers and more. All the tools you need for delicate work. They are quiet, precise and vibration-free for extended use during hours. The PROXXON central offices are located in the picturesque area of Niersbach, very close to Germany's oldest town, Trier. PROXXON's exclusive distributors in more than 80 countries are serviced from here.